With a twist of using Coca-Cola as an ingredient in the cupcakes, they are fluffy, chocolatey and delicious! 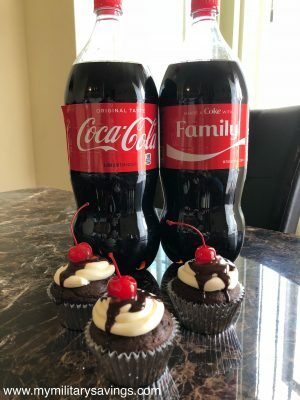 These Coca-Cola Cupcakes are a must-try recipe! When I saw this recipe, I knew I had to make more than one batch. I ended up making two dozen, one to keep at home, and one for the battalion so the Soldiers could enjoy them, too, and they were GONE in a matter of minutes! I am not a professional baker whatsoever, so when I found this recipe, I was a bit hesitant. But, let me tell you, these were super easy and look how they turned out! So cute and yummy! Explore different toppings, use chopped nuts, strawberry glaze, whipped cream – there are so many options to make these cupcakes your own. Line a cupcake tin with 12 cupcake liners. Preheat your oven to 350°F. 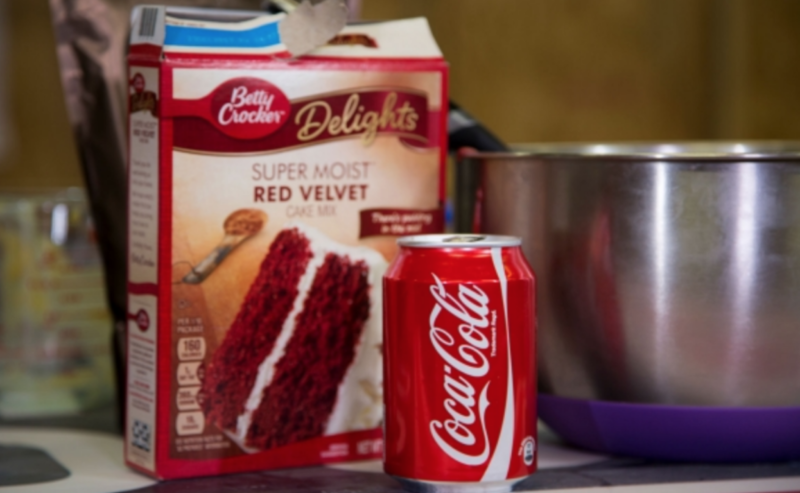 In a large bowl, combine the cake mix and can of Coca-Cola until a smooth batter forms. Scoop the batter into cupcake liners, making sure the batter is evenly distributed among all 12 cupcakes. Place the cupcake tin in the pre-heated oven and bake for 20-22 minutes, or until baked through. Remove the cupcake tin from the oven and allow the cupcakes to cool completely. **Once cooled, pipe your favorite icing! Hack: Use a sandwich bag, put it in a cup, fill it about 3/4 of the way with icing. Pull it out, cut one of the corners of your bag and viola! Your own piping bag. In a small saucepan over medium heat, warm the heavy cream hot, just not boiling. Spoon the glaze on the tops of the frosted cupcakes, allowing it to drip down the sides a little bit. Top it with a maraschino cherry!